Olga Kurylenko, Naomie Harris and Rosamund Pike attend the IWC Schaffhausen Decoding the Beauty of Time gala Dinner during the launch of the Da Vinci Novelties from the Swiss luxury watch manufacturer IWC Schaffhausen at the Salon International de la Haute Horlogerie (SIHH) on January 17, 2017 in Genève, Photo by David M. Benett/Dave Benett/Getty Images for IWC. 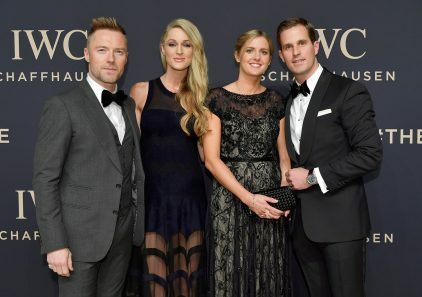 On the night of January 17 at a private gala event, IWC Schaffhausen and a thousand VIP guests visited Genève to celebrate the arrival of the new Da Vinci collection. ‘The new collection is a modern interpretation of the iconic Da Vinci design from the 1980s. Along with its haute horlogerie innovations, the collection once more includes references that have been designed deliberately with women in mind—as is indicated by various features such as smaller case diameters, moving strap horns, diamond-set bezels and leather straps by Santoni in various colours,’ explained Georges Kern, CEO of IWC Schaffhausen. 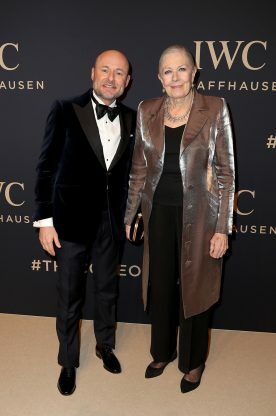 Numerous IWC brand ambassadors and international stars such as actors Rosamund Pike, Vanessa Redgrave, James Marsden, Sonam Kapoor, Olga Kurylenko, Jean Reno (with Zofia Reno), Game of Thrones’ Joseph Mawle, Naomie Harris, Zhang Zi Lin, Chen Bolin, Isabelle Huppert, Taylor Schilling, Moritz Bleibtreu, Barbara Becker, Franziska Weisz, Elyas M’Barek, Palina Rojinski, Hend Sabri, Murilo Benício, Pierfrancesco Favino, Ralf Möller, Anna Ferzetti, Anna Drijver, Rob Brydon, and Sir Patrick Stewart; singers and musicians Ronan Keating (with Storm Keating), Sunny Ozell, John Helliwell, and Sebastian Bürgin; TV presenters Raya Abirached and Alessia Marcuzzi; photographers Mika Ninagawa and Murad Osmann; producer Juan López Salaberry; sporting and racing legends Nico Rosberg (with Vivian Rosberg) Lewis Hamilton, Niki Lauda (with Birgit Lauda), Fabian Cancellara, Jan Frodeno, Arsène Wenger, Jochen Mass, Carmen Jordá, Oliver Bierhoff (with Klara Bierhoff), Alexei Nemov (with Galina Nemov), Günter Netzer (with Elvira Netzer), and Ion Țiriac; models Karolína Kurková, Adriana Lima, Vanessa Lorenzo, Monika Radulović (with husband, artist Alessandro Ljubičić), Andrés Velencoso, and Natalia Zakharova; chefs Andrea Berton (with Sandra Berton) and Diego Guerrero; and influencers such as Alexandra Lapp, Tiany Kiriloff, Kristina Bazan, Xenia Tchoumi, Elias El-Indari, Nadya Hassan, Lana El Sahely, Nicole Warne, Germina Preses, stylist Ana Antic, Sandra Bauknecht, Chiara Maci, and Negin Mirsalehi stepped onto the red carpet. Danish singer MØ performed live on stage at the event. Kern’s successor, Christoph Grainger-Herr, made his first appearance at a major celebrity event, as did Monika Kern, who accompanied her husband. 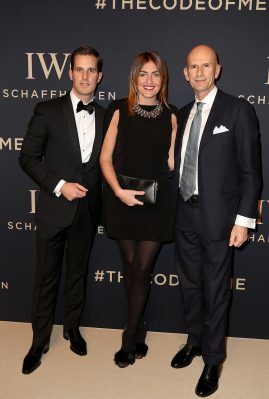 IWC’s CMO Franziska Gsell also attended, as did IWC VIP customer, man-about-town Tim Jeffries.